The mission of Pony Club: The United States Pony Clubs, Inc., develops character, leadership, confidence and a sense of community in youth through a program that teaches the care of horses and ponies, riding and mounted sports. The idea for Pony Club started in Great Britain in 1928. The founders recognized the need for any child with an interest to have access to excellent equestrian education and training. The idea was so successful that it soon spread to other countries. 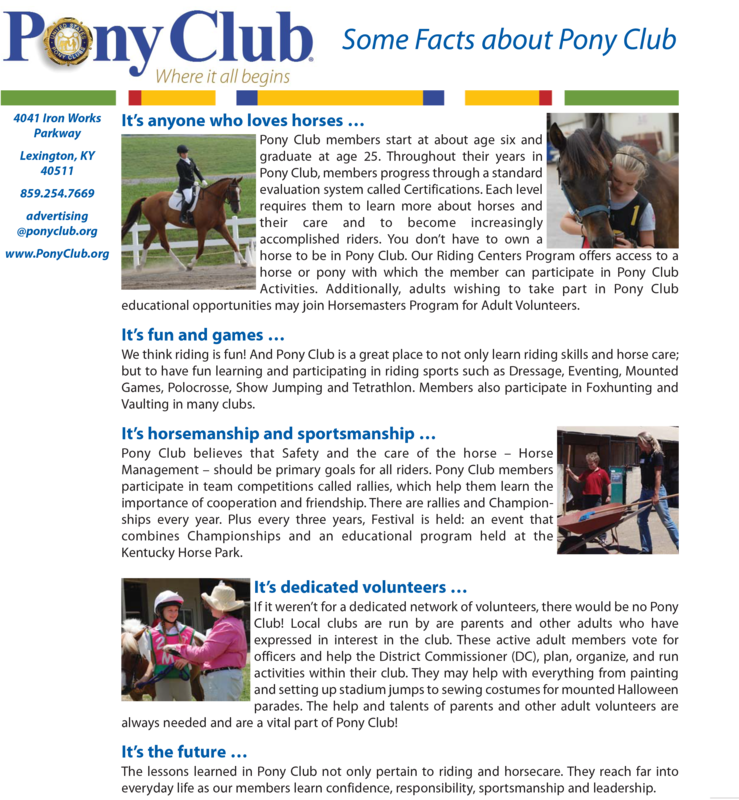 In 1954, Pony Club came to the United States and today flourishes with 130,000 members. An impressive percentage of the world’s top riders in international competition are graduates of Pony Club. Pony Club members learn how to handle and work around their horse with safety and self-reliance under trained supervision. Pony Club played an integral part in the development of equestrian sport safety helmets. All members are required to wear helmets, and safety checks before riding is a Pony Club “best practice” to ensure that equipment is in good condition and properly adjusted. Everyone begins Pony Club at the same level. As members learn and develop at their own pace, they have the opportunity to progress through the Pony Club certification system. Each level requires an increasing depth of knowledge and skills. The highest certification distinguishes the rider as an accomplished, professional-level horseman. Pony Club teaches a solid foundation of correct riding based on timeless classical principles. Members learn good balance and communication, developing into thinking and effective riders, always with the horse’s best interests at heart. Members have opportunities for a host of additional programs such as international exchanges, regional and national clinics, National Youth Congress and college scholarships. Lessons include 45 minutes of riding and 15 minutes of grooming/tacking up as well as caring for your mount afterwards. Members must wear polos or collared shirts to lessons, shirts must be tucked in, belts, field boots or paddock boots and half chaps, USPC medical armband, and ASTM certified helmet. Unless of an emergency, a 24-hour notice of lesson cancellation is required if a student cannot attend their scheduled lesson otherwise lesson charges will occur. • Group mounted lessons are held Saturdays and Sundays. Private lessons are also available. • Group unmounted lessons are offered twice per month. Rallies are scheduled throughout the year in various locations in Orange County. Prices vary due to location and level. a. Include your check for $140 made out to USPC yearly Dues. c. Include your check for $100 to Turning Point Farms, Inc.
A USPC Medical Release armband. Order HERE. The “D” Manual. Order HERE.